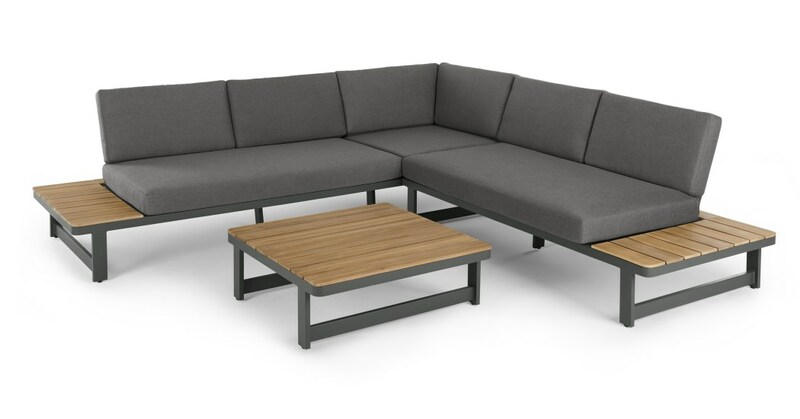 Solid acacia wood, powder-coated aluminium, soft grey seats – Topa's got style covered from all angles. This large outdoor corner sofa seats five, comfortably. Each end of the sofa has a built in side table, perfect for holding your drink. Plus, there's a slatted, square coffee table too – everyone can relax empty handed. This is a piece for the serious sun seeker: it's design led, with a luxe appeal and a modern silhouette. Its crafted with care, and durable through all weathers – just bring the cushions in when it's wet.